This handbook sets out an innovative approach to the theory of law, reconceptualising it in a material, embodied, socially contextualised and politically radical way. The book consists of original contributions authored by prominent academics, all of whom provide a valuable overview of legal theory as a discipline. 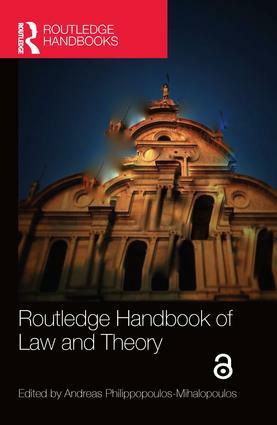 Through this structure, the handbook brings the law into active discussion with other disciplines, as well as supra-disciplinary debates on the areas of spatiality, temporality, materiality, corporeality and sensorial studies, capturing the most exciting developments in current legal theory, and anticipating future research in the area. The handbook is essential reading for scholars and students of jurisprudence, sociology of law, critical legal studies, socio-legal theory and interdisciplinary legal studies, as well as those people from other disciplines interested in the way the law converses with interdisciplinarity. 24. Anne Bottomley and Nathan Moore On new model jurisprudence: the scholar/critic as (cosmic) artisan. Andreas Philippopoulos-Mihalopoulos is Professor of Law & Theory and Director of the Westminster Law & Theory Lab at the University of Westminster, UK.